With thousands of games on the Google Play Store finding quality ones can be difficult at times. When it comes to action games for Android there are many different types available. It’s one of the most popular genres with tons of choices. Everything from shooter games, fighting titles, racing, jumping, running, and much more. 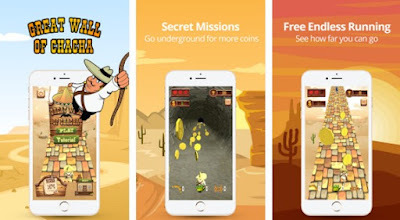 If you want to find the perfect run and jump game for your android, we researched and found one, a great choice for all action game lovers - Great Wall of ChaCha: Jumping & Running. Great Wall of ChaCha: Jumping & Running is for sure one of the most entertaining and addictive game for Android users that love playing action games. Jumping and running through various missions, this game is quite easy to play and for that is suitable for all ages. The users can enjoy high-quality animations, designs, sounds, and graphics into the game environment, becoming addicted to the game quick. Certainly, this game offers everything action game lovers are looking for. High quality and yet simple game that offers the users many features and challenges to keep them interested in the game always. The game offers the users to complete 3 different and challenging missions to help ChaCha run and jump through many obstacles on the way while avoiding the guards to save his family. Also, the users can choose to use the boomerang to take the guards on the road down. On the way to completing the mission there are many coins for collecting and using them to unlock power-ups. The power-ups, also the power gloves and zip lines can help the users get through the mission and get the highest scores. Play and enjoy an amazing endless runner and jumper game, download Great Wall of ChaCha: Jumping & Running for free from the Google Play Store.